� Presseye.com- Nov26th 2016, Danske Bank Premiership. 'Carrick Rangers v Coleraine, Belfast Loughshore Hotel Arena. 'Carrick's Steven McCullough'and Coleraine's Brad Lyons'during Saturday's match at Carrickfergus. 'Photo by TONY HENDRON/Presseye.com. 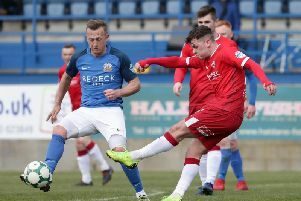 Coleraine’s impressive run of late came to an abrupt end on Saturday, but Oran Kearney has already challenged his players to start another one. The Bannsiders entertain Cliftonville on Friday night and Kearney is hoping his charges can leave their Carrick disappointment behind them. “It’s the end of a run and we put it to bed now and move on,” he told Times Sport. “The key thing is can we hit another double-figure unbeaten run this season? “Last season we went 14 or 15 games unbeaten. I challenged the players to go on another run last season, unfortunately we weren’t able to do it, but I will be challenging them again now. “I sincerely hope the players will be itching to put the record straight again on Friday night. “Cliftonville are right in the mix of things and coming down to The Showgrounds under lights on Friday night will make for a great game. “If we want to stay in and around that area we need to beat the teams around us. “Cliftonville are going well, they have had a really good month so they will be full of confidence. Coleraine will be hosting a special festive family night at The Showgrounds as part of Friday night’s game. There will be Carol singing, a visit from Santa, face painting, mince pies and mulled wine, drinks promotions and the club shop will be open for gifts. Everyone welcome, under-11s free when accompanied by an adult.